Good Lock 2019 was released in early March this year with Android Pie compatibility as the major highlight, and the Good Lock team had also offered details on some upcoming functionality that would arrive with new plugins at a later date. Those new plugins have now been released and are available through the Good Lock app. The first one is Nice Shot, and its primary highlight is that it enables video screen recording across the OS, along with the ability to record sounds as well. 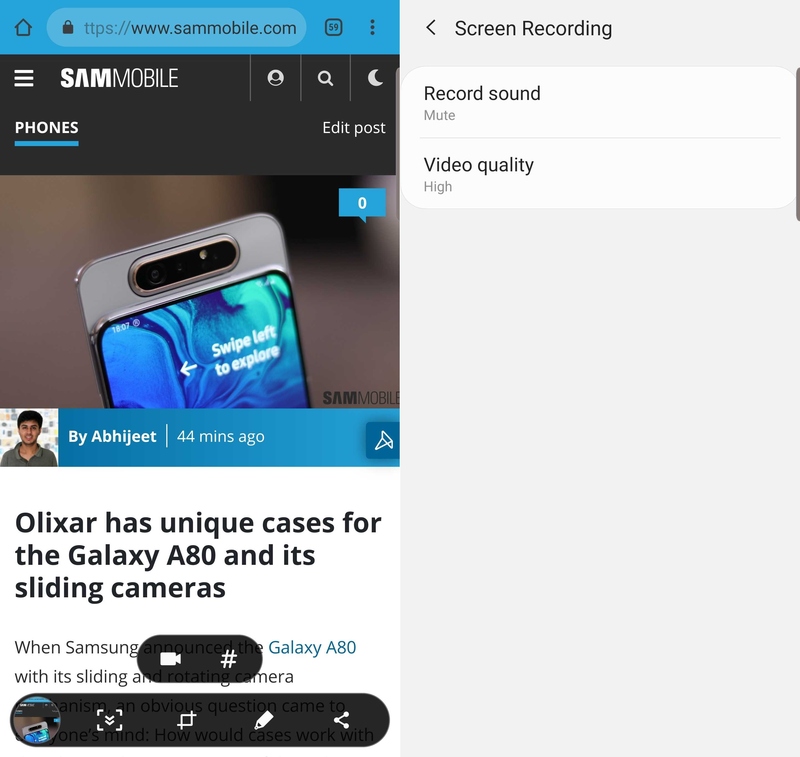 There are plenty of screen recording apps available on Google Play and you can also use Samsung’s Game Tools functionality to record the screen in third-party apps, so Nice Shot isn’t offering anything new, but it is an official solution from Samsung. Nice Shot works as an extension of Samsung’s Smart capture feature, and as a result, it first needs you to take a regular screenshot using the volume down and power keys. Then, when you get presented with the usual Smart capture options such as editing, drawing and taking scrolling screenshots, Nice Shot simply adds two buttons on top. One is for screen recording, and the other allows you to quickly add tags to the screenshot (tags are basically like Twitter’s hashtags and can be used to list all images and photos with a particular tag). Unfortunately, you first take a regular screenshot and then tap the screen recording button to record the screen. This might be deliberate, though, so that apps like Snapchat and Instagram can notify users that someone is trying to take a screenshot of their messages. The second new plugin is NotiStar. Android’s notification shade can be quite a mess when you have a lot of notifications pending, especially when you have to expand some of them manually, and NotiStar solves that problem by showing every notification in expanded form in a separate screen. You can search for notifications through this screen, although you have to search for a person’s name or a word from within a notification – searching for an app name doesn’t do anything, so its use is rather limited. You can, however, set custom filters and keywords and define which apps get included in the search results. And even more useful is NotiStar’s ability to save notifications for a period ranging from seven days to forever, so unless you clear them out from within the NotiStar interface, they’ll be available for your perusal for the selected period. NotiStar can be quickly accessed on the lock screen by swiping up, but, like Nice Shot, you don’t get a quick shortcut to NotiStar outside of the lock screen, so you have to first open the Good Lock app. Download the new Good Lock plugins now! 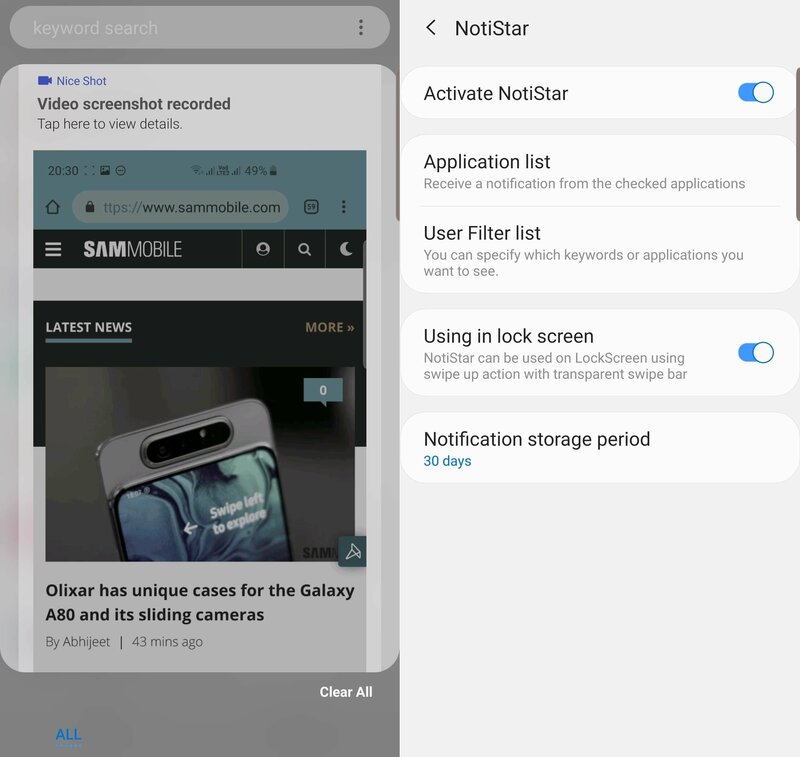 If you already have Good Lock installed on your phone, just open the app, look for the NotiStar and Nice Shot options in the list and tap on each to download them from Galaxy Store. If they aren’t available in your country, you can download the APK files from our database (Nice Shot | NotiStar) and sideload them on your phone. Those who don’t have Good Lock installed nor have it officially available in their country can check out our guide on how to manually install it. There’s bug in Nice Shot app on S10+ when hidding the navigation bar. The rec & tag button position seem too low due to hiding the nav button. And why I can’t find “Nice Shot” app instead “Tag Board” app after installed the apk ? Installed notistar in my note 9 but the settings menu is faded, unable to change the settings. I want to disable it in lockscreen. I installed Nice Shot on NOTE9, but I don’t have ”Delete file after share via” and ”#tag Menu” functions when I open the settings. I also don’t have # button when I am taking a screenshot (but there is a button for recording), how to solve it?